This establishes a relationship between the candidate and the interviewer and also eliminates the awkward feeling between the two. Icebreaker interview questions necessarily do not establish a chance for you to get a job, but these questions are very important for almost any kind of formal interviews. Many interviewers use icebreaker questions to assess how well you communicate with others, how well you keep the conversation, how much do you think and how well you are able to pass the required information. Why Icebreakers Are So Important? The purpose of asking icebreaker questions to the candidate in the interview process is to cool and ease down the interviewee. As per Yvonne Walker, the founder and managing director of HR with Ease, says there is another important purpose to the questions. “All questions should aim to obtain information,” she says. This is one of the sure questions that every candidate has to say whenever he/she appears for an interview. This is the ideal icebreaker question. First of all, try to sound that it is not too rehearsed. Try to be as genuine as possible. The answer should be honest, short and sweet. Do not talk endlessly about all the details of what has happened in your life – recruiters do not want to hear that. Instead, try to focus more on yourself, your educational qualification, work experience, any extracurricular activities and so on. Anything that helps you see as a strong character. Even though, this question is an icebreaker, try to use this opportunity to sell your character to them. Try to be as honest as possible about this one. If you left the previous job by choice, then try to explain what was the reason. Try to make sure that you are responsible for your own deeds. If you were fired, try to explain what was the circumstance and what was your mistakes – if any – make sure that you won’t repeat them again. Whenever you talk about your previous jobs, try to be real, honest and the most important of all, be optimistic. Being honest about the circumstances of your previous jobs show that you are honest in yourself. You should expect this question at every company interview, especially when it is a large company like Google, Yahoo etc. This is the main reason why candidates are directed to do as much research as possible about the company before the interview. Find out about the history of the company, when and where they started and where they are now. What is their motto, what are the current issues that they are encountering and who are the current players in the company? And so on. When you answer such questions, the interviewer will feel that you are genuinely interested to work for the company and also you are very much interested in being employed by them. Also another type of question that you should expect in an interview. Try to do your homework as much as possible and try to make sure that your answer is satisfactory. Do not give an impression that you are searching for a job just because of money. Try to base your response based on the knowledge that you have acquired and try to make sure that you are interested in the business aspect of the company. Always try to relate the answer of this question to your personal skills and goals. This is also a softball question. Try to answer this question by stating your skills and personal qualities and incorporate that with the motto of the company. Try to include factors such as honesty, hard work and all other optimistic qualities as your strengths and make an impression to the interviewer that you are an able candidate for the position. Point out what all aspects within you is beneficial and will help to improve the company and help to reach the company goals. Try to sound confident but make sure that you are not too confident or cocky. In technicality, interviewers or candidates should not ask such questions. If this question somehow makes way into the interview, try to steer clear out of it and do not answer the question too specifically. Being specific about the time duration can be potentially dangerous and can even lead to fail the interview. At the same time, do not be too vague. Being too vague makes the interviewer feel that you are hiding something from them or you are not being honest to them. Instead, try to answer in a neutral method like “I want to work in the company for a long time”, or “when both the sides feel that I am doing a good job”. Also, try to deviate the next question based on this question by adding some interesting facts so that the interviewer is interested by those facts. Another main point to keep in mind is that you should not be flustered if any employee asks such question. Try to face the question with a smile, no matter what kind of question it might be. Try to be as honest as possible here. The main reason being the answer depends on what kind of person you are. If your circumstances allow you to work overtime, then for sure say that you are interested in working overtime. But if not, then be as honest as possible. Do not try to keep up with promises that you cannot keep up. This will be seen as dishonesty by the employer. Try to keep in mind that the more honest you are, the more chance you will get for bagging the job. This is a loaded and a delicate question. The best way to answer such a question is not to answer directly. The best method is to ask the interviewer the range of the position, the employer will be taken off guard and will tell the range. Use this opportunity to say that this is a considerable amount of pay and that this is suitable for the job you are applying. If you want to impress the employer even more, then do your homework very well and state that “ I understand the range of the job is from this much to that much “. Then include points such as I believe that this much salary is appropriate to the position I am applying for. Either way make sure that getting the job is the first priority, money comes as its by product. This is to assess whether or not you have a distinct attitude towards work. If you get these kind of questions, always ensure that the interviewer is not here just to hear your side of the monologue. If you have a specific philosophy or attitude towards work, feel free to say so and also add what is the reason you have such an attitude towards work. If you do not have any such philosophy, then try to state a view that you feel towards work. Make sure that you are stating these qualities for the betterment and development of the company. This is one of the most sure, overlooked and yet ignored form of question. In fact, many applicants treat this as an unimportant question. The end attitude of the candidate can be seen if he/she fails to ask question to the interviewer. Instead, always think of insightful questions such as, “how can I be an asset to the company? how can I use this company as a platform to increase my skills? How can these skills be used for the development of the company?” try to be prepared with such questions so that you can use this as a chance to clear some doubts about the company. Rapport and unity among the team members and co workers is very important as it can lead the company to great heights. This connectivity can lead to trust among the employees which also plays an vital role. There has never been an employer who alone has been successful. A organizations growth and development is completely based on its employees and their hard work.So employers should work more towards building up a great team which in turn will help you be successful. Tell me something about your first job ? Are you reading any book now ? Which one ? Did you ever met any famous person? Name a person you admire the most and Why? Name a instant skill which you would like to learn? Name the band which you liked the most 10 years ago? Do you remember any childhood memory? Which was the place you visited recently for the very first time? What is your most liked family tradition? Who was the most influential person during your up bringing? What’s the first thing that you had spend on with your first pay cheque? What is the one thing that you would like to try next year, which you haven’t tried earlier? Have you been lately surprised by anything? Do you have any favorite destination that you have never visited? Which was your last seen favorite movie? Did there happen any instance where you had to return something? which you have bough in the last few days? Have you recently noticed anything that made you laugh a lot? Which advice do you think is the best one you have ever got? Any favorite charity which you like more people should know about? Do you have any phobia that you would like to overcome? What type of breakfast do you like the most? How would you like your eggs to be ? Do you have any hobby of collecting anything? Icebreaker questions are only used for small talk but you can also use it to assess the qualifications and skills of the candidate attending the interview process. With the help of these questions you can also gauge their work experience and check whether they are perfect fit for your company or not. Why do you think this job is perfect for you? Interviewers use icebreaker questions to assess the skill of the candidate. When an interviewer asks to tell a bit about yourself, then do not go deep into highly personal topics, instead, try to focus on subjects that you feel will be beneficial for the development of the company. Interviewers tend to prefer your educational qualification and details like your degree, where you studied, any extracurricular activities that you have joined and such. This also includes contributions that you have made with your previous jobs. If your employer asks you how your weekend was, but in reality, you were spending the weekends cleaning up, then do not elaborate on how terrible and boring it was. Instead, state them how you solved the problem. This shows that how well you can work under pressure and how well you can solve the issue. If you do not have much to say about your weekend, tell that your weekend went well and ask the interviewer about his/her weekend. This shows that you are able to maintain a rapport with two people. This shows the interviewer that you are very optimistic and have a positive attitude and also you are respectful to others. The main purpose of icebreaker questions is to start a conversation. This is necessary so that both the interviewer and the candidate can have something to talk about. Also, try to have a conversation with the interviewer, do no try to memorise everything you just studied. This might make it sound rehearsed and fake. Instead, try to make a genuine conversation and also just add the basic points that you feel should be said to the interviewer. Always pause between the sentences, make eye contact and then smile to the person in front. This adds a factor of reality to your answer and does not make your answer look like it has been pre planned and studied. Use this opportunity as a way to communicate to the interviewer and show that you are able to communicate more effectively and clearly. Keep in mind that icebreaker questions are asked with the main idea of starting an interview on a positive note. Try to answer icebreaker questions more clearly, effectively and try to answer them as moderately short as possible. This way the interviewer can concentrate and ask you more about other factors such as questions relating to your educations, questions related to your job. 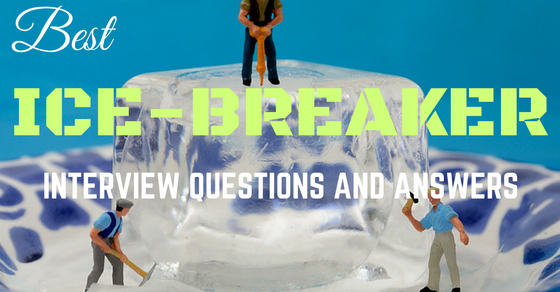 The main questions are more important for you in securing the job than icebreakers. But keep in mind that both questions are necessary for the success of the interview. On one hand icebreakers are used to gauge your overall personality and communication skills, while the main questions decide how much of a good employee you are. Also, do not state everything, word by word as such from the resume. Try to give an overall look about yourself including, your skills, your qualifications, your behavioural qualities etc. Try to create a good impression to the interviewer during an icebreaker question. Make sure that you try to project your qualities fit and at par with the motto of the company and also emphasize that you can be a worthy employee capable for a positive contribution for the company. Try to give an impression to the interviewer that you can be a valuable asset to the company and can be a beneficial employer to the supervisors. Try to sell yourself and try to point out why you think you are an able candidate for the job and why you are deserving for the applied position within the company.